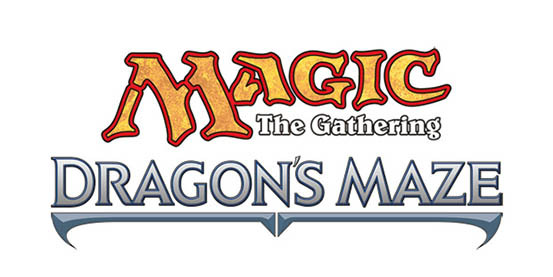 Dragon's Maze booster pack at $3.00 first wave is a Magic the Gathering expansion set scheduled to be released May 3, 2013. The booster box contains 36 boosters of 15 cards each. It is the third set of the Return to Ravnica block and will contain 156 cards. All ten guilds of Ravnica will be included in the set. As in the original Ravnica block, Dragon's Maze focuses on multicolor cards. Prerelease Events: April 27-28, 2013 Release Date: May 3, 2013 Game Day: May 26-27, 2013 Magic Online Release Date May 13, 2013 Official Three-Letter Code: DGM Design Team: Alexis Janson (lead) Mark Rosewater Erik Lauer Aaron Forsythe Shawn Main Dan Emmons Development Team: Zac Hill (lead) Erik Lauer Mark Globus Mark Gottlieb Masami Ibamoto Sam Stoddard. When you walk in to a Dragon's Maze Prerelease, you'll get to select your favorite guild from among all of the ten guilds of Ravnica! That guild pack will have a secret allied guild, which will share one color with your chosen guild, and also always be from the opposite set as your chosen guild. So let’s look at an example: You’re a Dimir player, so that’s the guild you pick. That guild pack might have Return to Ravnica's Azorius as its secret ally (although it could also be Izzet, Rakdos, or Golgari). That guild pack would have four Dragon's Maze booster packs, one Gatecrash Dimir guild Prerelease pack, and one Return to Ravnica Azorius guild Prerelease pack. The two guild packs will be the same as they were in their original Prerelease, but will not have that set's Prerelease promo for those guilds. The guild Prerelease packs will not contain a Spindown life counter, sticker, or guild welcome letter. Everyone who plays in a Dragon's Maze Prerelease will get the same alternate-art promo foil card, while supplies last. This card will not be playable in your Prerelease deck. There's also a maze! Players (that's you) will work collectively to advance their chosen guild through the Implicit Maze each round. There are prizes for each guild that gets all the way through the maze, and special prizes for the first guild that does it. And when the maze is completed, all participating players will receive a premium (foil) basic land promo card! That's better! The fifteenth card in all Dragon's Maze packs isn't basic land; it's nonbasic land. All ten guildgates will be showing up (with the Dragon's Maze expansion symbol), as will all ten shocklands from Return to Ravnica and Gatecrash (with their Return to Ravnica or Gatecrash symbols). You are about half as likely to open a shockland in Dragon's Maze as in Return to Ravnica and Gatecrash and, since this is for all ten shocklands rather than five, that means you are about a quarter as likely to open a specific one. There's also a mythic rare land from Dragon's Maze that will show up there sometimes!